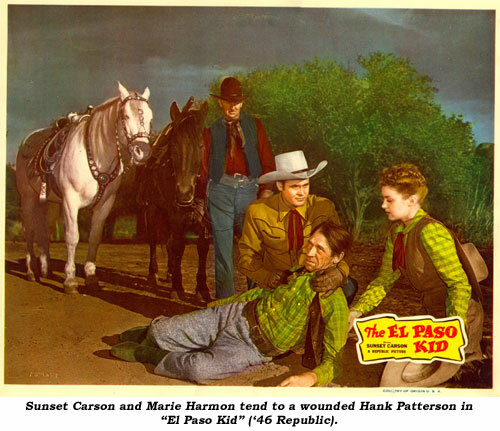 Hank Patterson was one of a handful of character actors who cornered the market on portraying cantankerous old coots in westerns, working heavily at Republic from ‘46-‘51 in 17 productions, then easily transferring to the juvenile TV westerns as all sorts of old timers (“Lone Ranger”, “Hopalong Cassidy”, “Gene Autry”, “Wild Bill Hickok”, “Roy Rogers”, “Cisco Kid”, and perhaps best remembered in this period as the old timer host of Bill Williams’ “Kit Carson” [‘51-‘55] with a bottle of Coca-Cola in his hand). 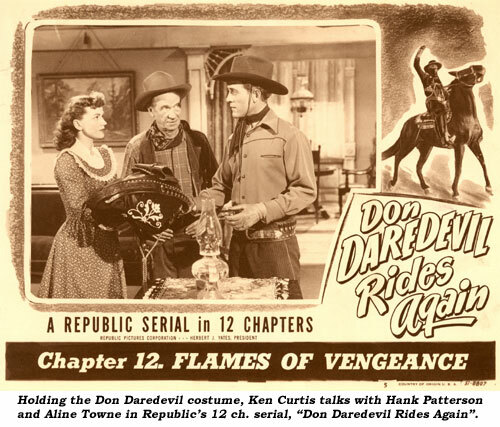 When the more adult oriented TV westerns came into vogue in the mid ‘50s, Hank was right there on “Wyatt Earp”, “Texan”, “Trackdown”, “Bronco”, “Tombstone Territory”, “Maverick”, “Johnny Ringo”, “Lawman”, “Tales of Wells Fargo” and dozens more. 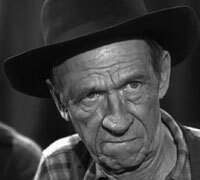 But late in his career Hank is perhaps best remembered for the role of Hank Ziffel, a semi-regular on “Petticoat Junction”. In ‘65 that role was expanded on “Green Acres”, and even a few times on “Beverly Hillbillies”. The association of Hank’s character with the extremely popular Arnold the Pig ensured Patterson a place in TV history. Ironically, by the time Patterson was doing “Green Acres” he was in his late 70s and almost completely deaf, but the producers loved his portrayal so much they worked around his hearing impairment by having the dialogue coach lying on the floor out-of-shot tapping Hank’s leg with a yardstick as a cue to speak his line. 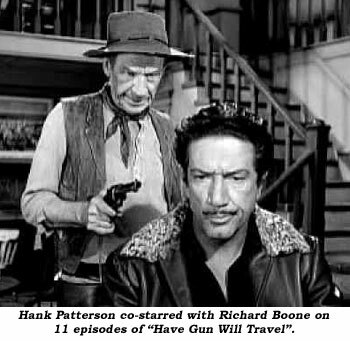 Additionally, from ‘62-‘73 Hank played the recurring role of stableman Hank Miller on “Gunsmoke”, replacing original stableman Moss Grimmick played by George Selk (who, incidentally, is not the same actor as Budd Buster although widely reported as such). Elmer Calvin Patterson was born October 9, 1888, in Springville, AL (30 miles north of Birmingham). His great-grandfather was an original settler of St. Clair County, AL. A farming family, Hank’s father was Green Davis Patterson and his mother was Mary Isabella Newton. Hank had two older brothers, one younger brother and one younger sister. Between 1894 and 1897 the family left Alabama to live in Taylor, TX. Starting out to be a serious musician, Hank eventually settled for playing piano in traveling vaudeville shows. By 1917, at 28, according to his Registration Card, he was married to a dancer in his troupe named Daisy (born 9/22/1892 in Kentucky) and was living, at the time, in Lubbock, TX, listing himself as a traveling actor. The couple moved to L.A. in 1918. According to the 1930 Census, the Patterson’s were living at 13255 Reedley Ave. in L.A. with Hank employed as a real estate salesman. Not unlike William Fawcett who also played a variety of old-timers, Patterson didn’t get into film work until ‘39 when he was already 51. 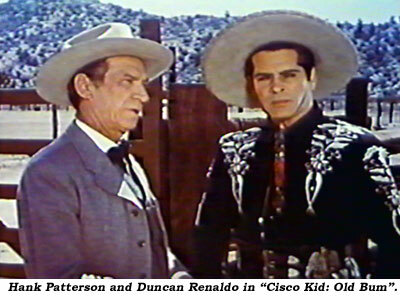 His first role, uncredited, was in Roy Rogers’ “Arizona Kid” as a townsman. After a role in “Three Faces West” (‘40) he made no more films til “Abilene Town” in ‘46, causing one to wonder if he was in some way involved in the war effort, although he was already 53 by the outbreak of WWII. Late in life Hank was named honorary mayor of Winnetka, CA (in the San Fernando Valley). An amiable, easy-going man with a wry sense of humor, he never lost his initial love of music and had 15 songs published, most of them in the Victor Herbert genre.